Dianne Harris. Little White Houses: How the Postwar Home Constructed Race in America. University of Minnesota Press, 2013. 392 pp. Last year marked a milestone in my life as a multiracial immigrant to the United States who has thus far warded off steep downward mobility. The purchase of a modest ranch-style house located on the corner lot of a quiet, leafy street was arguably the most explicit investment in whiteness our family had ever made. This is not only because home ownership is a freedom that has most vigorously been exercised by white, middle-class Americans through racially restrictive covenants, blockbusting, and risk-free loans, but also because of the house we bought. A bit of a threshold itself, the house was built in 1945 and stands on the architectural cusp of the conventional postwar house that anchors Dianne Harris’ study. Absent is the seamless indoor/outdoor living spaces created through sliding glass doors to a ground-level patio. But present is the single-story open plan, picture windows and generous built-in storage. The real estate listing was another point of seduction, photographing the house in isolation from its neighbors and describing it as having “original style” that had been “enhanced and blended tastefully with today’s modern conveniences”—an extraordinary, but still practical home. One year on, I daily engage this vestige of mid-twentieth-century racialization and what is arguably a still active channel for generating privilege. With broad and meticulous strokes, Little White Houses inspires precisely this kind of self and spatial reflection. Narrating the nexus of race and residential space, Harris expertly details the postwar house as a spatial template for mid-century American whiteness. Eight abundantly illustrated chapters chart the design, marketing and consumption patterns of white, middle-class domesticity, beginning with the practices of Rudolf and Eva Weingarten, Harris’ maternal grandparents. The Weingartens were German Jewish immigrants who, in addition to acquiring U.S. citizenship as soon as possible, acquired, furnished and maintained a house that would secure their footing in the normative strata of postwar whiteness. Harris’ descriptions of their single-family, detached house are distributed throughout the book and become a gateway for historical analysis of how this housing form produced white racial identities for a generalized market of American homeowners between 1945 and 1960, including immigrants looking to assimilate. The strategy is two-fold: first, to “search for the spatial cues of [white] racial/ethnic construction in the banal, and seemingly, benign, setting of the ordinary house,” (13); second, to make those cues appear strange to readers vis-à-vis their hyper visibility in the promotional apparatus of the housing industry and their adaptations by immigrant homeowners, like the Weingartens, for whom postwar houses became “efficient frameworks for forgetting past lives” (50). The strategy works well. Little White Houses adds conceptual rigor and archival depth to the story of U.S. housing as a site of racial significations that support socio-economic forms of discrimination, while also revising the story of mid-century residential architecture as something more quotidian, and potent, than the avant-garde plans of high modernism. The result is a major historical study that takes on the unfinished business of revealing how white identities have been glorified and normalized in the American vernacular. Trained as an architectural historian, seasoned in the literature on race and space, and Director of the Illinois Program for Research in the Humanities at the University of Illinois, Urbana-Champaign, Harris opens her study by navigating an impressive range of scholarship that signals the breadth of her topic and audience. Here, architectural and urban history meets visual and material culture studies and scholarship on racial formation. While some of the exegesis may be redundant to those already working within these approaches, Harris clarifies their collective merits for understanding how inhabitants and viewers of the typical postwar house adhered to the “contours of residential conformity: how to look like everyone else and, essentially, how to be white” (32). Harris is unflinching in her assertion that postwar domestic space was an iconographic field of white racial power, one that was not only ubiquitous but also often overt in its exclusionary rhetoric and operational through systems of class, gender and sexuality. Invoking Slavoj Žižek’s concept of ideological cynicism, she argues that Americans bought into these meanings at full throttle without any mystification; a case of recognizing the codes of whiteness as codes, understanding their economic and social value, and profiting from them (13). The first chapter unpacks the typical house in all its underestimated force. Situating her analysis within the geography of segregated housing, Harris catalogs the key words and spatial characteristics that designated whiteness across various administrative bodies, films, literature and taste-making handbooks. Describing neighborhoods as having “integrity” or “school quality,” white immigrant residents as “clean” and “thrifty,” and design and decor in terms of “privacy, ease, luxury, freedom, informality, order, cleanliness, and spaciousness…” was common, euphemistic parlance in housing discourse (37-43). A close reading of the Weingarten’s house from 1955 generates a rich analysis of how these ideas materialized in 1,250 square feet of living space, and how they anticipated elements that would become standard issue in houses thereafter, including the 1958 “California style” house designed by A. Quincy Jones and Fred Emmons for Popular Mechanics. In addition to interpreting these spaces as prescriptions for normative white identities, Harris also attends to the “programmatic and design disjunctures” that developed in spatial practice: Eva Weingarten’s use of the utility room for storing kosher dishes, for example or, more recently, the propensity for some Chinese immigrants to convert laundry rooms or garages into second kitchens for serious cooking. The qualifications help nuance the whiteness of these houses as a relay between designed and appropriated environments. Two more chapters tackle house imagery in shelter and popular magazines and architectural renderings, respectively. Harris demonstrates how popular periodicals and their visual representations did the heavy lifting of constructing “a structure and a set of norms for the bleaching of difference” (61). Subscription booms and editorial decision-making for middle-brow publications like Life, McCall’s, and House Beautiful form the discussion in Chapter Two, which stresses both how they appeared within actual homes and how they conventionalized mid-century domesticity into a narrow band of white middle-class heterosexuality. Chapter Three examines specific visual techniques that made ordinary homes and gardens appear credible as prospective real estate purchases and the objects of postwar consumer fantasy. Central to this discussion is the rise of illustrations with axonometric or aerial views, which “provided potential consumers with a visual language of freedom in which the eye was unconstrained by either a single viewpoint or any boundary other than the edge of the page” (89). Harris’ accompanying images of perspective drawings by, for example, California ranch house architect Cliff May, House Beautiful’s Pace-Setter House, and the atypical tongue-in-cheek images by architect Arne Kartwold energize the analysis, as does the 10 x 8” trim size of the book itself. The mid-sized horizontality of Harris’ volume allow for image reproductions that echo the scale, dimension and sensibility of the actual houses. Chapter Four takes up privacy as a hallmark of postwar housing, examining how it functioned as a Cold War euphemism for white, middle-class personhood that was connected to ideas of spatial purification, autonomy, and protection from the “other” (national, sexual, racial or, surprisingly, generational). Remarkable here is how she integrates a sprawling cultural analysis of the concept with pointed treatments of the spatial devices of household privacy and its compromises. Here, for example, we learn that open-plan designs were a source of tension because they constructed physical and visual connectedness within the family unit, but also a desire to retreat from its members, especially intrusive children—a valuable complication of the “family togetherness” thesis of 1950s domesticity. The dialectic between the picture window and the exterior privacy wall is another carefully presented example. Loosely associated with the distinction of high modernism’s ribbon windows from the early twentieth century, the extensive glazing of the picture window eventually conflicted with privacy anxieties of homeowners after World War II, who opted for street-level barriers to control their degree of public visibility. The following three chapters throw emphasis on commodityscapes, approaching American mid-century houses and their stuff as expressive consumer products mediated by sociological studies (including Russell Lynes’ infamous taste chart from a 1949 issue of Life), retail trading stamp programs, built-in furniture and storage systems, and television home shows. Each archive further expands Harris’ core claim that postwar space articulated what David Roediger calls the ability of white identity and privilege to hide in plain sight (30-31). Harris’ consideration of what filled people’s homes, how these goods were displayed and concealed, and what kind of television programming facilitated these processes, confirms that while whiteness is “the accretive impact of multiple media forms operating simultaneously” it habitually appears as a natural or neutral spatial formation, invisible and everywhere (260). A final chapter moves out into the yard. Specific design elements and material objects serve as focal points for interrogating the transformation of residential gardens from the food-bearing land familiar to Old World and Non-European immigrants to aestheticized property with clean horticultural lines and neighborhood discipline. Some discussions of this green space are fresh and incisive, such as the paradox of a leisure area that demanded regular homeowner labor, or how architects alternately designed patio areas as outdoor rooms and living rooms as indoor patios. Another seems like a trouble spot for a history of middling modernism geared towards expunging the past—namely, the popularity of the Black Sambo lawn sprinkler that revived the 19thC cast-iron lawn jockeys and their associations with an antiquated plantation South. The concluding analysis of fences is a vivid indication that postwar residential design was deeply involved in the symbolic and physical work of securing property values, national membership and racial exclusion. As might already be clear, one strength of the fifteen years of research that culminated in this book is the near exhaustive content therein. Harris leaves almost no room, image, word or artifact unturned in her project to make everyday spaces strange and complicit with racism’s institutional face. The book’s visual sources are partly to thank here. Numerous photographs, illustrations, plans, advertisements, tables, charts and television stills give strong and varied evidence that these were keenly imagined spaces working over myriad lives at the level of the body, person, reproductive family, neighborhood and nation. In the same vein, Harris’ writing attempts to marshal a cross section of disciplines towards a common analytic cause. It is a demanding and worthwhile task, but with the occasional casualties of narrative tone and flow. A second strength of Harris’ work is the questions it raises, if inadvertently, about the status of materiality in American racial history. A key argument within the race-as-representation paradigm, to which this book belongs, has been the arbitrary nature of racial signifiers; e.g., there is nothing intrinsically white about a string of straight, blond hair or a blue eye. In U.S. racial theory, these commitments are often traced to Michael Omi and Howard Winant’s seminal work on the historically contingent nature of all racial identities, and cumulative research on the mutability of the white/other binary. More recently, some scholars in the humanities and humanistic social sciences have begun to question not the contingency of race, but its claims to arbitrariness. At issue is if biological bodies (the chief markers of race) are indeed random and inert in the production of meanings, racial or otherwise—or whether they might “speak” in some influential way that tends to be overlooked in favor of more self-conscious and/or politicized forms of speech, forms that reduce bodily matter to resource. 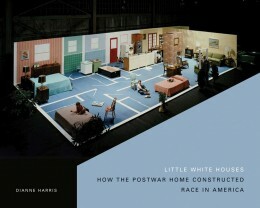 Though it is not reasonable to expect Harris’ already encyclopedic volume to have taken up these issues directly, it is tempting to ask how the lively, sensuous and other-directed materiality of bodies—and physical spaces—may have interacted with the ideological procedures of being raced within and through the iconic postwar house. How, for example, did people’s phenotype call out differently from one side of a picture window to another, and for whom? What did the presence of nonhuman bodies (dogs, cats, squirrels, lizards, ants, microbes) in indoor/outdoor spaces do to racial self-fashioning? How might radiant heated floors not only have connoted distinction but affected the degree to which bodies could stay as relaxed as the architectural style they inhabited? More brainstorms follow from the epilogue, where Harris surveys the contemporary housing market. On the one hand, Americans have witnessed changes to homeowner homogeneity, signaled by a recent housing bubble and pronounced diversification of the nation’s suburban population. On the other, the author points to the enduring structural racism of the American landscape via, for example, unfair lending practices and real estate steering. But what are the racial iconographies of domestic space today? How does the fall of the McMansion, renewed interest in prefab dwellings and the tiny house movement relate to mid-century trajectories of spatialized whiteness? What do HGTV, Home Depot and other facets of the home/garden industrial complex owe to postwar magazine editors like Elizabeth Gordon and on-air personalities like Arlene Francis? Where does Arne Kartwold’s mockery end and unhappyhipsters.com begin? Harris’ book succeeds on the well-established terms of its named fields, as well as by opening up lines of inquiry that can complicate, intensify and update the racial registers of what Americans call home. There is nothing little about these little white houses. George Lipsitz, The Possessive Investment in Whiteness: How White People Profit from Identity Politics (Philadelphia: Temple University Press, 1998). Michael Omi and Howard Winant, Racial Formation in the United States: From the 1960’s to the 1990’s, 2nd ed. (New York and London: Routledge, 1994). See, for example, Arun Saldanha, “Reontologising race: the machinic geography of phenotype,” Environment and Planning D: Society and Space 24 (2006): 9-24; Michael Hames-Garcia, “How Real is Race?” in Material Feminisms, eds. Stacy Alaimo and Susan Hekman (Bloomington: Indiana University Press, 2008), 308-3. Lisa Uddin is an assistant professor of Art History and Visual Culture Studies at Whitman College. She is the author of Zoo Renewal: White Flight and the Animal Ghetto (University of Minnesota, Forthcoming 2015), which considers the history of improving zoos through the racial dynamics of American postwar urbanism. Her new research on design and survival examines the graphics and architectures of vulnerability in the postindustrial United States.